I am just a girl REFUSING to be normal! But to pass across the mind of God to you. Would you blame people who labour tirelessly in their 9-5 job knowing well it’s their only source of income? What of someone who knows what lies in the end but puts in all efforts to change the outcome….would you blame them as well? Well… I doubt I would in my present state of mind… But all I’d feel for them is pity! I woke up this morning feeling pity for the devil….hehehe! Like do you get? Why does he keep fighting battles that Christ has won for us already? Now if a man can work relentlessly to make ends meet within the little time he has to work…how much more the enemy who knows very well that in the end he looses?! Guys he’ll do anything! As a matter of fact, he is doing everything and that includes lying to you and me! Tell me one lie the the devil has told you and I’ll show/tell you the truth from where he lurkingly manipulated it from! And this clearly shows that he’s FAKE! That’s his nature! Originality is sure a strange thing for him! Speak it! Speak it with all amount of power and boldness then get going! You know naturally when people tell a lie about us we pay less to no attention to it cos there’s really nothing you can do to change the conception the person holds of you (well unless God intervenes). SNUB HIM! AND DO THAT THROWING THE TRUTH AT HIS FACE! We should not waste our focus on what’s fake rather we should focus on what is true and on what will stand! Oh well I couldn’t just end my first blog post of the year without wishing y’all a Happy New Year! Thank you for reading! See you on my next blog post! Author iyhneewritesPosted on February 5, 2019 2 Comments on Lying Liar! I just wanted 2018 to go! I was tired of it. I wanted it to fly with every struggle it presented, the stab of pain it came with, and even the unpleasant tidings it brought. I wanted it to take a bow dragging along with it the feeling of discouragement and negativity. I just wanted to draw the curtain bading 2018 farewell together with the stacks of disappointment it entertained me. Trust me I have eaten a lot from the plates of disappointment served from places, people, situations (chuckles). I wanted to personally drive 2018 away with the horrible feeling of setback it brought! Do you think I’m being too harsh on 2018?….. Maybe! You know I actually thought that too sometimes. But that was me, in my lowest place! This is me not trying to pen it down like its been all silver and gold. For some very weird reason I happen to write this blog post in tears I guess it’s because I’m taking baby steps outta my comfort zone and it hurts a bit. Things got a bit difficult for me as the end of the year approached…. Just as a swimmer tries to paddle her hands and legs against the ferocious waves of the sea to stay afloat but her hands and legs got weak, her lungs were filled with water, she was obviously weightier to remain afloat on a sea that wanted to drown her! And your guess is right she lost it and got drown. I just couldn’t handle it anymore which leads to the outburst of feeling in the second verse of this post. But it didn’t end there…. I deviced a plan and the thought of it kept me sane and going even though I had questioned it’s reliability and viability on several occasions. My plan was to start everything afresh in 2019. So I had a plan of everything I was gonna do, how I was gonna do it, with whom I was gonna do it with…you know, I had them all planned out and fam that included the blog. I hadn’t written for a while on the blog so my plan was since I’m starting everything afresh next year by God’s grace I might as well start blogging again in 2019. So a new 2019, apparently a new and better me 😁, new ideas, new visions, new blog😂😂😂 Osheyyyy 2019! This 2019 must be a blast year o. After my friend had said this to me “You know it’s almost not really about how you started but more of how you’re finishing!” I went back home thinking hard on it. That quote was stemmed from the fact that I had told her I was planning on posting again on the blog in 2019 after she had asked on several occasions why I haven’t posted anything on the blog lately. ◾Waiting for 2019 was what I wanted for myself not what God wanted for me. I wanted to feel ready and so I closed my eyes to the fact that God had already made me ready! ◾I wanted to wait for the oppositions to clear but God wanted me to walk through those oppositions so I would have to lean totally on him! ◾I was waiting to start afresh in 2019 but what makes it so different from now? The fact that it’s a new year doesn’t mean no oppositions, neither does it make the devil become a better person so what makes me think if i couldn’t stay afloat now I would stay afloat then? I was wrong the whole time. God wanted me to START AGAIN instantly! Not in 2019. And so he made it clear to me, this will be the anchor of your blog post. Tell my babies I need them to START AGAIN NOW! As difficult as it was, here I am starting again! Shaming the enemy and his caucuses! Sweetheart, you can do it too! Are there things of urgency that God laid greatly upon your heart to do and you got so overwhelmed so you stopped?! You probably wanna start again next year, or oh sweetheart, maybe that was your final stop. You were just too discouraged, you never wanna take that path again. You might probably be reading this post with the same mindset I had some weeks ago…. that a lot of things have gotten so out of hand, they are beyond repair so needless beating yourself up for it just carry it over to the new year. Fam, regardless of the numerous reasons, we all have a word and a common ground to START AGAIN! You thought God didn’t care about how you felt and so you pulled out? He did! He did care! How do I know this? So you see? He understands and relates with everything we’ve been through and no! he’s not given up on us! So If there’s someone we should not pull away from? It’s him! If there’s someone we should be in partnership with? it’s him! Just because he’s walked this road before and only him can lead us through it all. There’s really never gonna be a perfect time to start again. Everyday is a perfect time to start again. That day might be today, tomorrow, the day after tomorrow or even next week. Trash the idea of starting over in the new year, it might just be one of the many antics of the enemy for you to cross over to the new year without facing your fears… Show him you’re not ignorant of his schemes! Therefore I challenge you to live every second of the remaining part of 2018 fearlessly, intentionally and unapologetically. SATISFACTION; What can truly satisfy? As a keen learner, I’ve learnt that satisfaction is not materialistic. For me, I had long searched for satisfaction in the wrong places and I only got hungrier, thirstier and unsatisfied. I know most of us can resonate with this. Horizontal relationships that blossoms? Great! Family like no other? Beautiful! A job that pays your bill and loads your account? Wonderful! Children that brighten your day and sing your praises? Blessed! Trust me you are deserving of every beautiful lot accorded you! They are yours to keep! But can you take a minute and make a quick search within? Now does all these good stuffs make you satisfied? Do they KEEP you satisfied? Does all these beautiful things make you experience the constant happiness and peace that comes from the well of satisfaction? Do you feel this is all you were created for? As you are still trying to figure that out, I’ll pen my thoughts and some of my experiences. I gave my life to Christ right before I returned to the last year of my secondary school days. My experience with God during that time was indeed indescribable! I loved God so much and I just wanted to please him. Months after, a lotta things changed. There was a drift in my relationship with God and of course y’all know who drifted away? Me! God never drifts away from us! And so all I felt was this large vacuum in me that needed to be filled. All the while unknown to me, I had been sourcing ways to fill the gap, searching for true satisfaction, knocking on wrong doors, drinking bad water and eating spoilt food! I got more concerned with getting good grades, sourcing for admission(of which I got) and doing so many other irrelevant things that kept me busy but never really satisfied me nor drew me closer to God. During this time I had less to no relationship with God. Yes! Thankfully I was not the type to sin anyhow😁 (that sounds funny though) Or better put I was “morally right” and so in my deceitfulness, “I was headed the right way”…..so i thought! My “moral righteousness” and little petty talks from others pushed me to joining the choir in my local church in Nigeria. And oh goodness! I was sooooo committed! Unknowingly, this was in my quest to fill up the vacuum I was feeling, the gap between me and God. To trick myself and others into believing I had a GOOD relationship with God. This was me trying to be so busy FOR the lord but absolutely NOT busy with the lord! This was me longing for true satisfaction! Fast forward to today! I’m more concerned with my relationship with God more than anything else in this world…yeah and I’m being sooo INTENTIONAL about it! I rededicated my life to Christ 2015 Aug and I can proudly say I’ve been rocking this boat with him and it’s been worth every rollercoaster experience! It’s been a pure bliss! “I’m truly satisfied with Christ, in Christ! He’s filled me up till I yearn for no more. I mean, I only yearn for more of him! If he can remain the pivot of my life then every other thing will fix itself regardless of how they might look presently! Today, i’ll choose obedience over sacrifice! I’ll choose building my relationship with God over every other thing! Fam are you reading this and you’re yearning for satisfaction? I’ll let this out! Nothing of this world and in this world will truly satisfy! Your boyfriend/ girlfriend can’t satisfy you! Your spouse can’t even if they tried! Fame and all the attention that comes with it can’t satisfy sweetheart! Money, drugs, addictions can’t satisfy you! Falling back to that sin won’t satisfy you! And as cliche as it might sound…. If you haven’t given your life to Christ this fountain of water springing up into eternal life unfortunately is not promised you! So I’m challenging you today and beyond to surrender, create, mend, build up your relationship with God! Crown him the pilot of your life! And your destination will be eternal while you drink from the well of satisfaction! Author iyhneewritesPosted on September 5, 2018 September 5, 2018 12 Comments on SATISFACTION; What can truly satisfy? Who’s been overlooked, displaced and sidelined. She has stopped trying. she’s wrong! Somewhere out there is a woman. A woman no longer comfortable in her skin. She’s provoked at the course of her image. Irritated at her Slim slender figure, her flat nose, full lips, plump figure. Today, the journey of yesterday comes to a halt. My shoes are buckled, clothes worn, eyes? Unto Christ as I premiere into this new phase. Yesterday’s journey gifted me with words and songs of PRAISE! I walk into this new phase praise full! I mean, God is faithful! I’ll never loose my praise! Did you ever think the journey was without pits? (smiles) No! There were pits! And I fell into them. I felt into some sleeping, into others being overconfident. In all, I’m grateful for the pits. They made me stronger, vulnerable(totally depending on the Holy Spirit), cautious and thankful. several years ago, I lived my life carelessly. I embraced life as it came, it tossed me as the wind, and I followed ignorantly, I was truly purposeless. Within the last year everything was defined. I unlearnt, learnt and relearnt…..
A Lovely weekend to you blogfam!!! I am just here to sound a remimder. Yes, call me your alarm clock, it’s fine😊. I woke up this morning with a slash in my heart and more than ever I really needed to swim in the God’s word as I have found it to be my only breakout. Guys the time is dangerous! I mean it! If you’re reading this, this is a reminder that this is not the time to sleep! Not anymore! It’s not a time to lazy about! It’s not a time to move as the wind directs with no direction whatsoever in view! Author iyhneewritesPosted on July 21, 2018 August 24, 2018 4 Comments on JUST A REMINDER!!! If you haven’t read the last blog post click👉 HE HAS PROPOSED!!! to read it. It will paint a clearer picture of today’s blog post. What??!! You mean you didn’t accept him? After you’ve stood him out there like forever? Oh! for to love is to be foolish. Is to be weak in disguise. with the stacks of rings on his hands. Sternly, I observed some more. Some walked passed him, totally blind to his existence. Author iyhneewritesPosted on July 12, 2018 August 24, 2018 2 Comments on WHAT IS YOUR RESPONSE? Don’t let the society define or control your dos and don’ts, and more so define who you are and who you’re not. Your definition is of God! You should check out what you really mean, and you’ll be amazed at the raw materials you were created with😳, plus how wrong the world was about you! 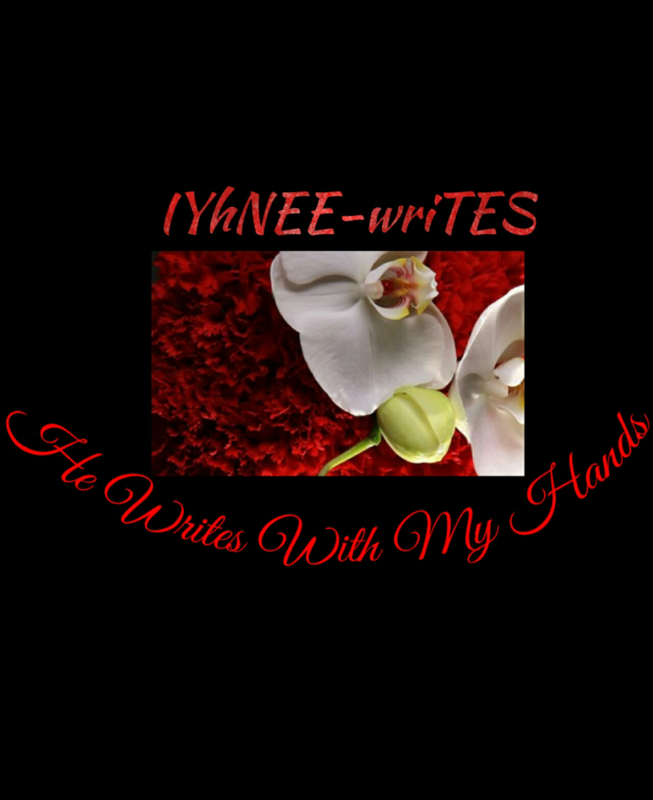 IYhNEE-wriTES Create a free website or blog at WordPress.com.